Friday 7th November at 8pm at the Jacqueline du Pré Music Building. 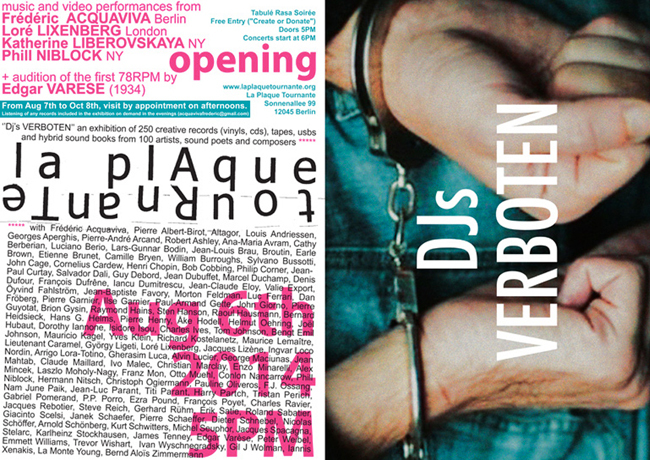 MANIFESTO captures the vibrancy and immediacy of manifesti, from Futurism in 1909 to 1960s Fluxus via Lettrism. Vocalist Loré Lixenberg, laptop artist Federico Reuben and Aleks Kolkowski on wax cylinders and horns bring the texts alive musically, highlighting their ground-breaking and sometimes shocking nature. A pop-up exhibition of rarely seen and exciting artefacts including manifesto tracts, original scores, sound poems and photographs as well as rare early records, by the manifesto authors, features alongside the performance. Like the lovers stretched out on the lawn of a lovely summer afternoon, drunk on the odor of plants and flowers, I dream. My mind wanders and returns to years ago. Among the trees and shrubs, I dream of my work. 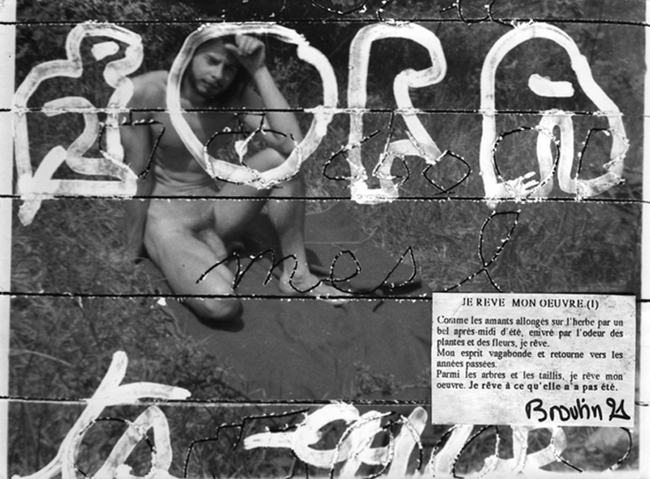 Series of 9 photographs exhibited in Paris, Pierre Lescot Gallery , 1991. 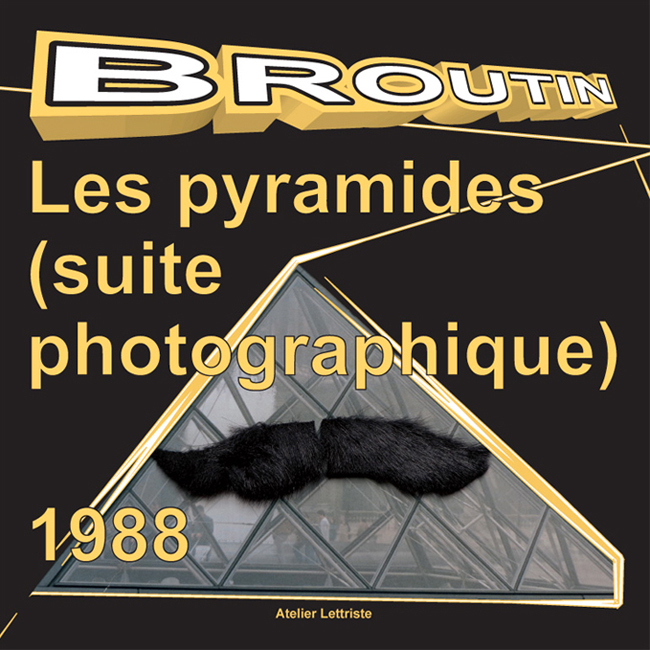 Photos taken in Trézan by Sylvie Fauconnier et Broutin. This edition is composed of 20 numbered copies signed by the author and 80 standard copies. 12 pages, cm 21x15. English translation by David Seaman. 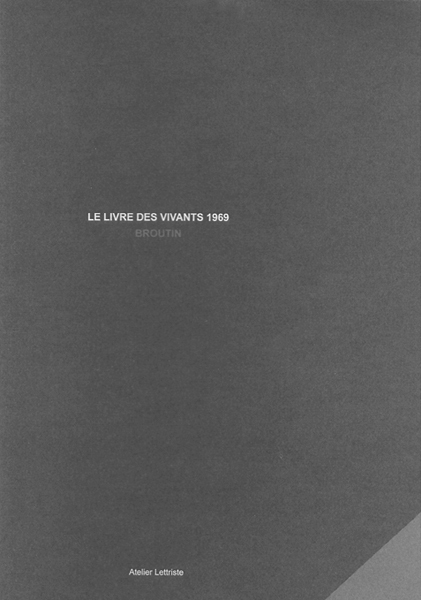 A facsimile of the first works by Lettrist artist Broutin, who joined the French avant-garde movement in 1969. 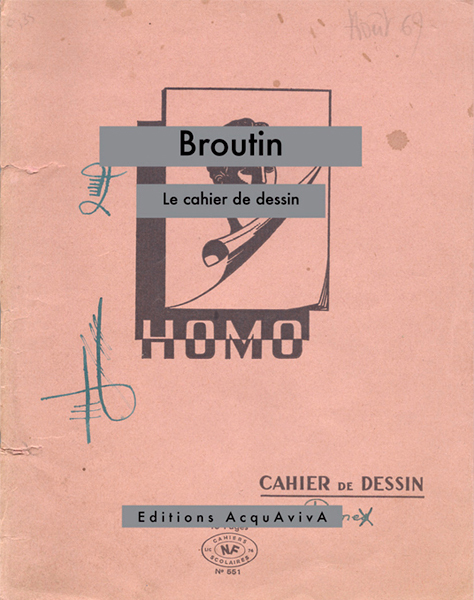 This pamphlet features asemic writing by Broutin, a kind of wordless writing characteristic of Lettrist art that has no meaning in terms of language. Pages 36, 24 x 18,5 cm, paperback, staple bound. Edition size: 100. Postcard Olga Fjodorova in Cadre a-optique 1971 - 2015. 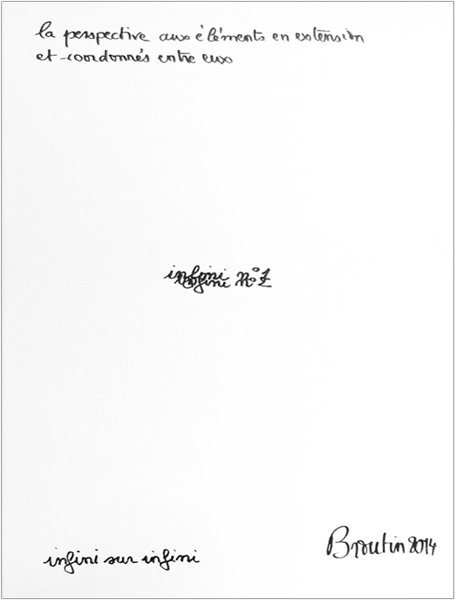 A limited edition comprising artist’s original works, multiples, objects, photos, video, audio CD, etc., signed and numbered from 1 to 100, box of cardboard, size 30x21x5 cm, with: Frédéric Acquaviva, Démosthène Agrafiotis, Vittore Baroni, Marguerite Belot, Broutin, Michel Collet, Graziano Dovicchi, Maria Faustino, Bartomeu Ferrando, Bernadette Février, Christian Grenier, György Galantai, Uwe Hässler, Jacques Juin, jacques Marlow, Virgile Novarina, François Poyet, Stella, Lucien Suel, Thierry Tillier, Tatiana Villani, Robert Wood, Hans Jürgen Wormeck. New Yorkers organized a protest march in the streets of SoHo. 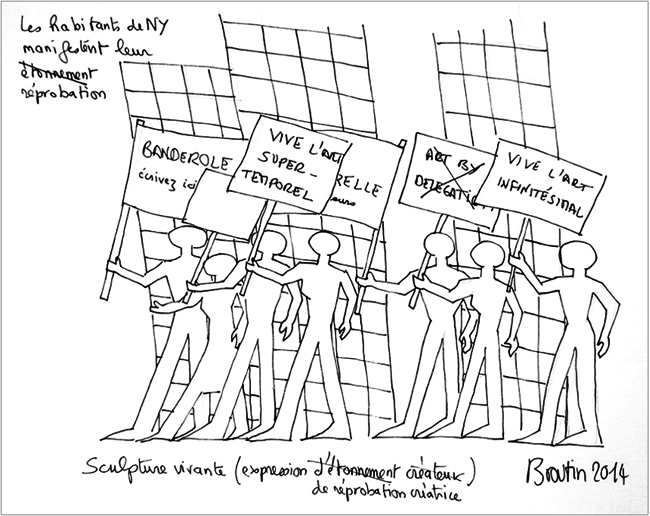 The demonstrators came from every borough to express their astonishment, indeed for the most engaged their disapproval, of the title and content of the show Art by Delegation organized in Brussels. James Trawisky participated in the demonstration, but expresses reservations about the radicalness of some of the entries: After all, this show can be considered an advance that takes into account the realities of public awareness and the state of the market. 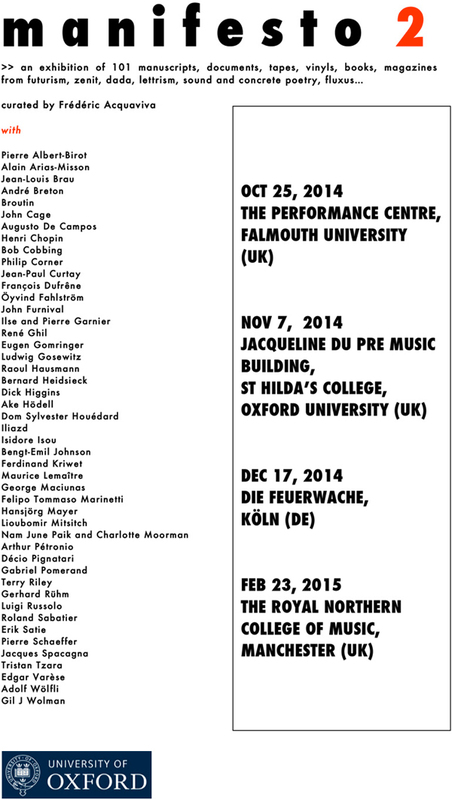 If it is a further step toward the propagation and recognition of this avant-garde movement, then why not? I am currently working on new editions of some of my previous works. I am writing to you about The Book of the Living, a small booklet that you were supposed to publish in 1970, for which I had given you the original drawings for the deluxe edition. Through the friendly intermediary of Frederic Acquaviva, last year I was able to lay my hands on an ordinary copy of it; this is the first time I had seen it. The facts are disappointing: the present edition was only printed with a few copies, and was never distributed. The deluxe editions were never done. After all this time, I am not looking to start a confrontation with you – as I should have done earlier – but rather to find a positive solution which will finally permit me to give this work its place in my bibliography. I am inclined to help you arrive at an outcome that satisfies both of us. Let me know what you would suggest on your part. This edition is composed of 20 numbered copies signed by the author and 80 standard copies. The first edition appeared in the journal Ipergrafi no. 7 in Paris in 1970. Published in only a few copies, it was never released. 24 pages, cm 21x15. English translation by David Seaman.